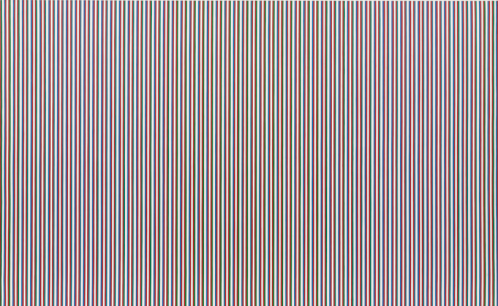 British artist Bridget Riley focusses on relations between form and colour with regard to the vivid and impressive phenomena of perception, to which she is inspired by nature. In this context, an active viewing, a ‘craft of seeing’ is crucial, a fact at which Riley hints in her theoretical writings, recently published under the title ‘The Eye’s mind’ by Thames & Hudson, and Ridinghouse, London. In her investigation of perception beyond representative depiction, Riley was primarily stimulated by Seurat and Cézanne; but also by rhythm and pace in the works of Mantegna and by Raphael’s use of lines, forms, space and colour. The artist’s wide-ranging exploratory process is rendered visible in her studies, which are gouache and pencil on paper or graph paper that precede the creation of the paintings. Riley expresses a continuous dialogue with her own work. Abstract forms, such as the stripe motive, are regularly revisited. Die Streifenbilder / The Stripe Paintings 1961-2012-Riley’s current exhibition at Berlin-based Max Hetzler gallery, features 15 paintings and seven works on paper.